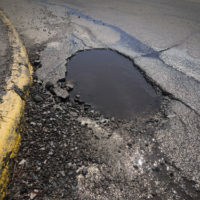 A city or state government responsible for the condition of the roads in a particular area may be held liable for accidents and injuries caused by a failure to maintain those roads. In a recent decision by the Appellate Division of New York, the justices considered a case where the injured plaintiff claimed that the lack of a “stop here on red” sign and stop bar, once present at the intersection, had been the cause of his accident. Ultimately, the Appellate Division agreed that the absence of such signage could make the City liable for the man’s injuries. In Chang v. City of New York, the accident victim and plaintiff, Kevin Chang, was driving along Park Avenue when he was injured. He had approached the intersection of E. 65th Street and Park Avenue, planning to turn left across the median of Park Avenue. In 1996, the City of New York had determined that a stop bar, along with a sign reading “stop here on red,” was necessary at that intersection, and had installed those signs. While the signs were present there as little as two months before Chang’s accident in 2008, they were no longer present when Chang was driving through the intersection that day. He initially stopped, but rolled forward into the intersection to try to see oncoming traffic as he attempted to turn left. Sadly, he was hit by another car, which injured Chang and killed his girlfriend, riding as a passenger. Among other defendants, Chang sued the City for failing to maintain the “stop here on red” sign and stop bar at the intersection. The City filed a motion to dismiss Chang’s claims before the trial court, claiming that Chang was responsible for his own injuries, and succeeded in convincing the trial court that Chang’s claim should be dismissed. Chang appealed to the First Department of the Appellate Division. The Appellate Division agreed that the City could be held liable for failing to maintain the traffic-controlling signage at the intersection. The court explained that the case law of New York made it a government body’s responsibility to maintain traffic controls once they are put in place. When a failure to maintain the traffic control – such as a stop sign or traffic signal – is determined to be the cause of an accident, the government can be held liable for injuries which result. The Appellate Division pointed out that circumstances might be different where a driver was familiar with the intersection and had driven through it when the stop sign or traffic signal was still functional. In such a case, the driver would have been aware of the need to stop, and could not make the City liable for injuries resulting from a failure to stop. However, in cases such as this one where the plaintiff had never driven through the intersection before and did not understand the dangers of not stopping where the stop bar or sign would have indicated, the City may be held liable for the injuries resulting from a crash. The Appellate Division determined that Chang’s claims had a legitimate legal and factual basis, and should move forward toward trial. If you or someone you love has been injured in an accident resulting from the negligence of another person, company, or government office, contact the skilled, compassionate, and determined Hudson Valley personal injury attorneys at Rusk, Wadlin, Heppner & Martuscello, LLP for a consultation on your claims, at 845-236-4411 (Marlboro), or 845-331-4100 (Kingston).